Along with Hemp seed, Maple Peas were one of the earlier particles baits used in fishing as a bait. Although not as fashionable these days Maple peas proved to be a very successful bait in the past (and still are). Maples are brown in colour, the size of a pea and can be used along with hemp and other particle baits as a great pulse bait for carp. Preparing Maple Peas for fishing. Preparing your maple peas is quite a simple task really, but as with all particle baits, preparation must be complete, i.e. fully soaked. Put the maple peas into a container, cover with water and leave to soak for 12 to 24 hours. Add sugar or a sweetener to the water. Flavours can be added if desired but because of their own distinctive smell I don't consider this necessary. As the maple peas soak up the water and expand you may need to top up the water. After soaking, tip the maple peas and water into a pan, bring to the boil and simmer for around 15 minutes. Too long boiling or simmering and the maples can turn to mush. After 5 or 10 minutes simmering, remove a pea and squash it between your thumb and finger to test it. The maple wants to be soft to firm (rubbery) so that it will stay on the hook. When you think they are ready, drain off the water, allow to cool and tip the peas into a bait tub if using within a day or so, or into bags for freezing. 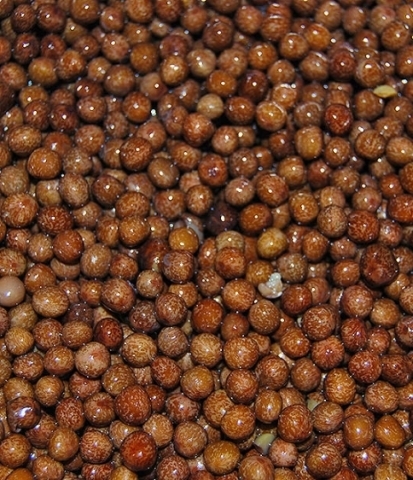 Some anglers prefer to allow Maple Peas to ferment before using them. To do this tip the boiled maple peas into a tub and leave to stew for 2 or 3 days in which time the peas will ferment and become quite sticky and give off an attractive milky cloud and a unique smell that attracts the fish. Feeding maples peas can depend on the water you are fishing and what you are fishing for. If you are stillwater fishing for carp you could lay down a bed of maples peas and wait for the carp to come along to mop this up. When river fishing a handful every now and then could do the trick.